The property is old but the value is excellent. This hotel is not fancy but it is a great location and the staff/owners are very kind and helpful. The room was clean and comfortable. Minimal noise from the hallway and adjacent rooms. The staff was friendly, check in was easy and an issue with the TV in our room was addressed quickly. The hotel was located within walking distance to a nice unobstructed view of Kirkjufell. The room contained a bed. It also contained a heater with an on/off switch, no temperature. That rounds out all good things about the property. The staff was very friendly and accommodating. Munir helped us feel welcomed and made sure we were happy. The hotel is very nice and I could see the northern lights from my window. Everything. Great location. Good breakfast. Clean and comfortable room. The staff was friendly and quick to respond to any needs. Right on the water. Perfect spot to see the northern lights. 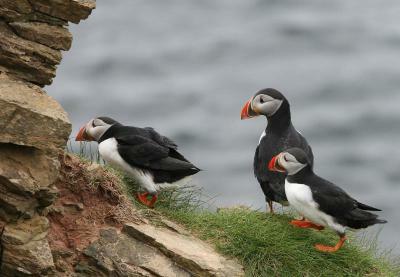 We could even see them from our bedroom window. It was amazing. Location is great except for massive construction project across street which blocks view, the street, and has bright lights going all night - obliterating chances to see the Aurora Borealis. 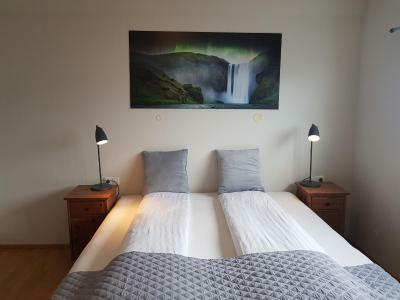 The location is perfect especially if you want to see northern lights, close to the tourist attraction spots. Staff are nice and helpful. Free Icelandic breakfast. We’re satisfied with our stay. It’s location is great—right in the spit on the bay. However, the trash receptacle is right next to it (on our end at least), and not pretty. It is in a rather industrial part of the harbor—but nicely kept, very clean, and with a good breakfast. Hotel backs up to water, with small parking lot you can park in between. There was quite a bit of construction going on around, it is in somewhat of a more industrial area. Front desk was very nice and informative, he recommended a restaurant for dinner a short walk away (we did go there but did not have reservation so had to come back an hour later, it was delicious though). Free coffee/tea/watered down juice 24/7. Very steep turned staircase difficult to navigate safely with a heavy suitcase! Room was fine, small but all we needed. Through window, could somewhat see to north to watch for northern lights but I still went outside to look for them during night! Nice breakfast included - waffles, bread/meats/cheese, fruit. For price, was a great value in Iceland. Short drive to Kirkufell. Staff were great and accommodating, even got breakfast our early for us one morning when we were leaving before it officially started. Location is phenomenal. Great for spying the lights right outside the hotel on the water. 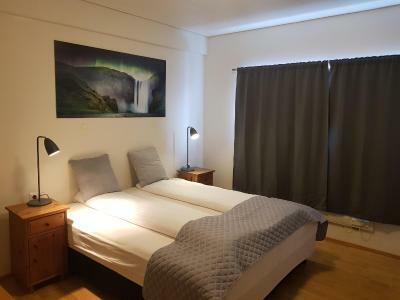 Kirkjufell Hotel by Snæfellsnes Peninsula West Iceland This rating is a reflection of how the property compares to the industry standard when it comes to price, facilities and services available. It's based on a self-evaluation by the property. Use this rating to help choose your stay! 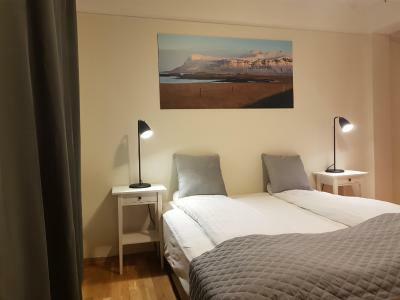 Located by the seaside with views of the fjord, Kirkjufell Hotel offers free WiFi and rooms with a seating area and TV. 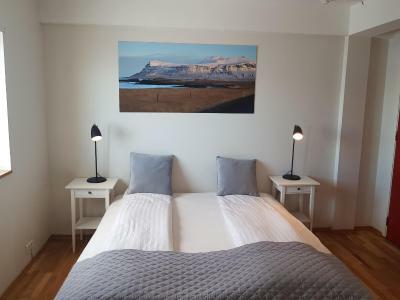 Some rooms also feature views of the mountain Kirkjufell, which is just 0.6 mi away. Snæfellsjökull Glacier is 16 mi away. The Berserkjahraun lava fields are a 20-minute drive away. Route 54 passes 1,300 feet from the hotel. 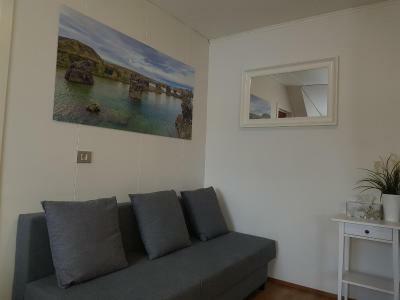 When would you like to stay at Kirkjufell Hotel by Snæfellsnes Peninsula West Iceland? Features a TV, tea/coffee facilities and a private bathroom with shower and hairdryer. 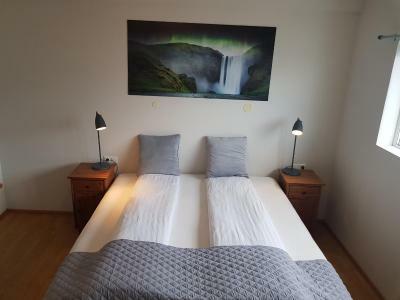 House Rules Kirkjufell Hotel by Snæfellsnes Peninsula West Iceland takes special requests – add in the next step! 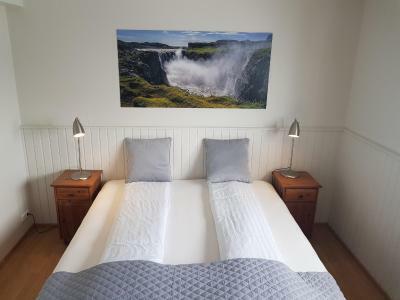 Kirkjufell Hotel by Snæfellsnes Peninsula West Iceland accepts these cards and reserves the right to temporarily hold an amount prior to arrival. Please note that the restaurant is only open in summer, from May 1st-September 30th. Special arrangements can be made on request. 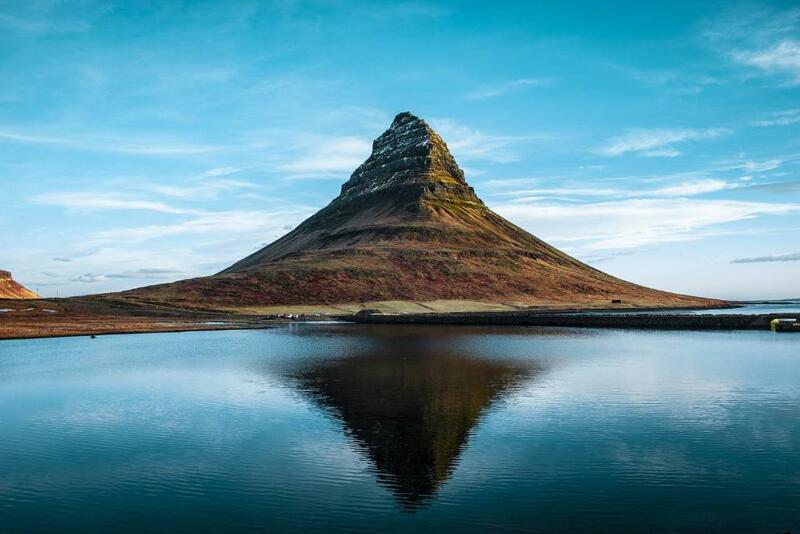 It's in a relatively remote part of Iceland, therefore not up to "city" standards. This is not a problem at all - it was a nice and convenient hotel that added to our experiences of Iceland. We were promised a ground floor room, and given one on the 2nd floor. No lift. No staff unless called by phone which took up to 10 minutes. Nothing worked in the room...TV, shower curtain broken, rotten bananas at breakfast. Staff rude. The highlight of the stay was the comfortable mattress topper. Love it. This place reminds me of a traditional ski lodge. Needs a bit of an update. The staff went above and beyond to help one of the group return early. Can’t recommend the place highly enough. Showers good and hot, nice breakfasts and great location. Wifi wasn’t working during our stay, however it was fixed on the day we left. A lot of construction is being done in the area surrounding the hotel which makes it difficult to reach it by car. It would be nice if some signs were there to indicate how to get to the hotel. Also, our room was kind of small when compared to that of our travel companions. Allthough, the price was the same. There is no elevator so be prepared to carry your luggage up some stairs. The host was very friendly. Breakfast was good and coffee/ tea was free. Rooms were clean, allthough I’m hearing mixed reviews concerning this. It wasn't very clean, the shower backed up within minutes. The entire hotel had a bad odor to it that I couldn't figure out what it was. There was no elevator with steep stairs which made going up / down 2 flights with a 50 lb suitcase a huge struggle. It was very close to Kirkjufell but in a very industrial street that was closed for construction. You don't want your stay in Grundarfjordur get ruined? Then stay away from this hotel! This was my 4th stay in this hotel, not the first, so I think I can say I know what I’m talking about. 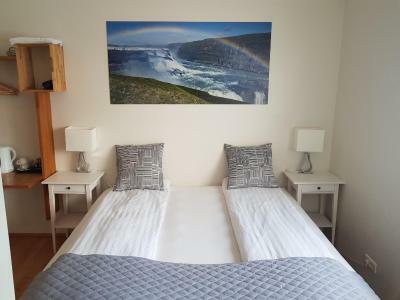 In the previous 3 times I really enjoyed my stay, the room were small but clean and comfortable and the staff very welcoming. Unfortunately I definitely cannot say the same this last time and for the following main reasons: Dirty rooms! - We found in our room the bathroom trash bin full of trash from previous clients (and there was not only paper inside …)!!! - Dirty shower with hair and pubic hair left from previous clients! - Shower and sink with clogged drains! - Bed linen dirty and with lots of hair that were not belonging to us! - Room floors dirty! - Visible lack of even basic maintenance! - Kettle in the room but no cups and left it with water inside for who know’s how long! - Twin rooms, charged the same amount than doubles, are even worse with mildew on the walls and water infiltrations from the windows! We asked to change the twins in doubles and at least for that there was no problem. - Poor staff service not even willing to make a restaurant reservation for us, the only thing they are efficient is in charging your credit card with the due amount! - Terrible and uncomfortable smell all over the hotel, from the lobby to the unbelievably dirty rooms! 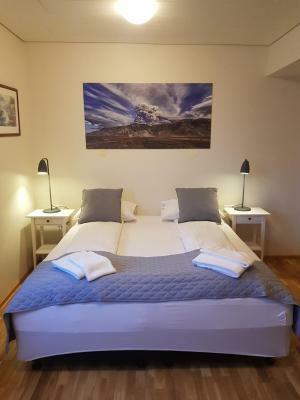 - We did book for 2 nights but after the first we decided to leave asking multiple times for a refund of the second night amount, refund that has always been refused! There is only one word to describe what this hotel has become with the new management: DISGUSTING! The worst hotel experience in my entire life and it’s unbelievable that such a poorly managed and maintained hotel is still in Booking.com offer! About the hotel: NOTHING! About Grundarfjordur: the village and the surrounding are are simply stunning but STAY AWAY FROM THIS HOTEL!! !